THE new Gurdwara Sahib Butterworth has been allocated another RM100,000 for its building fund. Chief Minister Chow Kon Yeow made the announcement before the opening ceremony at the gurdwara on Jan 21 in Jalan Todak, Seberang Jaya. “I am honoured to be here for the opening ceremony of the new Gurdwara Sahib Butterworth. It is made possible because of the tireless effort of the management committee, trustees and devotees. Chow (right) greeting the Sikh community during his visit to the new Gurdwara Sahib Butterworth. “Good job and well done! Your commitment means a lot to the Sikh community, not only in Penang but perhaps even the northern region of Malaysia. “This new gurdwara, located in the non-Islamic houses of worship (RIBI) enclave in Seberang Jaya, is the result of your resilience and focus towards the completion of the project. “I always believe that proximity fosters greater affinity. Let us work towards enhancing unity,” Chow said in his speech. He then announced the RM100,000 allocation for the gurdwara building fund. The cost of the new gurdwara is about RM6 million. Gurdwara Sahib Butterworth management committee president Narinder Singh (left) presenting Chow with a memento. 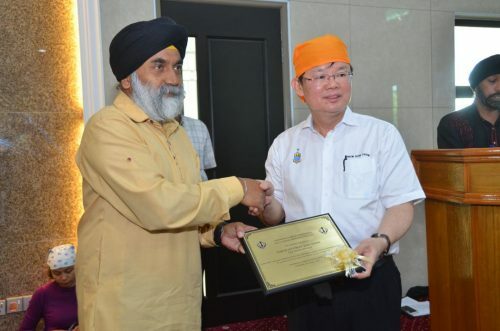 Penang Local Government, Housing, Town and Country Planning Committee chairman Jagdeep Singh Deo also said that he would provide a RM20,000 allocation for the gurdwara. He urged the gurdwara building and trustees committee to write to the state RIBI committee on its intention to install a lift at the gurdwara. Eligible RIBI fund applicant can receive a maximum of RM50,000 under the fund to renovate, repair or build new non-Islamic houses of worship. “I will look into your lift project. 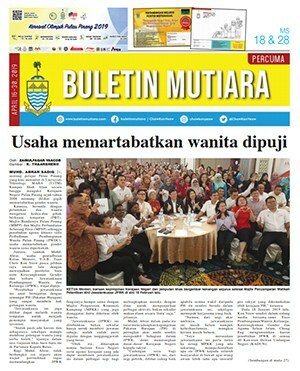 The Penang government is open to listen and address your concerns. “This new gurdwara marks another milestone for the Sikh community. Hats off to the team!” Jagdeep Singh said. Gurdwara Sahib Butterworth management committee president Narinder Singh said the gurdwara took about four years to complete. “The land was bought some 30 years ago. We want to thank our contributors for making this project possible. “The Penang government has contributed RM180,000 for this project during its construction,” Narinder Singh said. Also present were state Health, Agriculture and Agro-Based Industry and Rural Development Committee chairman Dr Afif Bahardin, Penang State Assembly Deputy Speaker Dr Amar Pritpal Abdullah, Bagan Dalam assemblyman M. Satees and Gurwara Sahib Butterworth trustees committee and building committee chairman Jagjit Singh.